The holidays are HERE and we are almost too late in getting this post up. BUT, we wanted to make a new tradition out of last year’s holiday dress shoot, and share a few of our favorite looks/dresses for the season again! This year we went with three totally different looks, and actually didn’t coordinate at all, but they all turned out looking super cute, put together, just the right amount of “dressy” for our styles, and perfect for any holiday gathering. Regan’s is a velvet jumpsuit (super comfortable), Sidney went with a classic LBD, and Paige’s soft + comfy sweater dress is slimming and a great option for dressing up the bump! Find links to our looks below, and a few other dresses we’re loving this season! There’s still time to get yourself something that makes you feel fabulous for the holidays! Hello! Paige here :) I’m 23 weeks pregnant now and have basically been living in oversized sweaters and leggings (perks of being pregnant in the winter)! I’ve searched high and low for the perfect oversized sweaters that are comfy and cozy, long enough to wear with leggings, and fall just right so they don’t make me look (as) huge! The four sweaters we’re wearing in this post are my absolute favs AND they’re almost all on sale. Woohoo! They’re all mine but Regan did this post with me to show that they’re still cute (in fact, way cuter, let’s be honest) if you’re not pregnant. Like I said these four are my favs but there are lots of other great ones out there that I’ve linked at the bottom of this post along with them! They have seriously been a lifesaver this pregnancy. Last pregnancy I was so self conscious about how big my legs got that I only wore dresses because I never wanted to show them. This pregnancy I just don’t care and would rather be comfy, so the thunder thighs are out in full force! I’ve gained about 25lbs so far (currently weigh 155) which puts me right about where I was weight wise my last pregnancy. I’m just hoping I can lose it all again! Bye summer 😭 so sad to see you go! The leaves are changing here and it’s officially starting to feel like fall. That makes us kind of sad because that means winter is around the corner. BUT we are making the best of it by pulling out our fall booties and sweaters and blankets and pumpkins. haha. These looks are simple, cozy and comfy - our favorite! We are wearing the same jeans in a denim and pink wash. 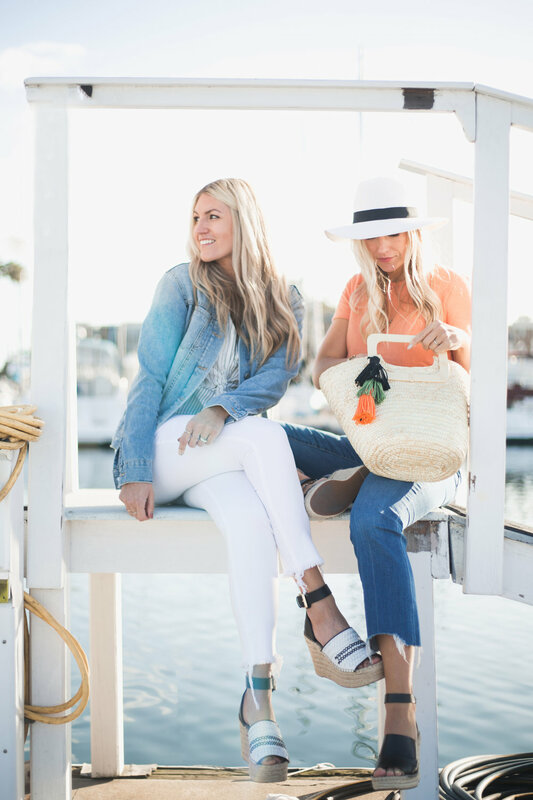 They were two of our favorites purchases during the Nordstrom anniversary sale, and Paige’s are currently back on sale for 40% off! We have some yummy recipes to post this fall, and some other fun content to share, so stay tuned! Outfit details below. Have you ever thought about starting a blog? We get so many questions (especially when we first started out) about tips for starting a blog and how to be successful. One of the things that has really helped us have some success in the blogging world is blogging together! Although it has sometimes been a challenge, overall it's been a great experience. 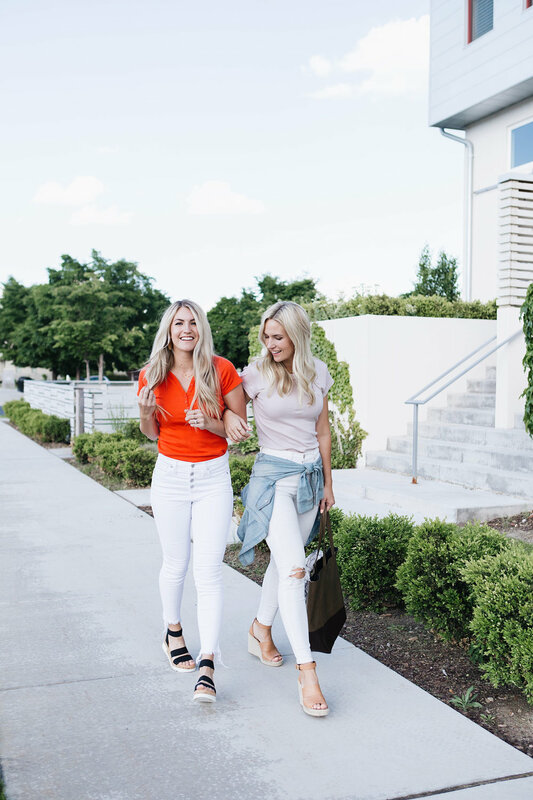 If you've ever thought about starting a blog for yourself, and especially starting one with a friend, below are some things to consider first! One of the great things for us that got our blog off the ground was following all three of our Facebook friends on instagram! There's a six year gap from Paige (the oldest) to Sidney (the youngest) so we had lots of different friends and age groups to follow. Because of that we got a lot of different followers up front just from following all of our friends! Sidney has never been super involved in the blog but we still took advantage of her facebook friends. Thanks Sid! Sometimes you just hit a rut where you don't feel creative and think of great content. When that happens you always have someone else to brainstorm with and/or take the reins! It can be a little embarrassing posting pictures of just yourself all the time, and feel a little self centered! We love being able to take pictures together so our feed isn't all photos of just one person! When one of us is in a crazy time of life, it's nice to have someone else in the picture to keep the blog alive! When either of us is pregnant especially, we don't ever feel like posting as much or doing outfit posts because we just don't feel cute! It's nice to have someone else who can take over. It's just inevitable. Whether you're starting a blog with a best friend or sister or whatever, be prepared for it! Even if you start out on the same page with what you want for your blog, the blogging world is always changing and you will end up with differing ideas of what you want your blog to be/where you want it to go. Learn to hear each other out and compromise! We go through phases of who is pulling more weight, but we are always arguing about it. Sometimes it's me (Paige) and sometimes it's Regan. Admittedly right now Regan is defintely pulling more of the weight with the blog as a whole. Even though I'm writing this post haha. I've been super busy with my real estate career and Regan has kind of been taking over. There have also been times where I have been pulling more weight. Either way it never seems fair. -Who chooses photos for instagram? This can big another big cause of contention! Obviously you're going to have different favorites from the photos you take together, so who gets to choose which photos go on instagram? (where we have our largest following). Sometimes one of us will look so fab in a photo and really want to post, but the other person looks hideous haha. Or vice versa! Agreeing on which photos to post can be a tough one. Especially if it's one of all three of us! When it comes down to it, the pros outweigh the cons for us. We have fought over our blog several times, and have all threatened to break off on our own (haha), but in all honesty none of us would want to be doing this alone. Kudos to all those blogger babes out there who do have blogs on their own! We have loved creating this outlet together where we can share all of our different styles, passions, and ideas. Here are our picks from this year's Nordstrom anniversary sale! Early access to the sale started yesterday, so you can shop these items now if you have a Nordstrom credit or debit card! We've divided our pics into the 3 categories we shopped this year; boys, women's, and men's! The little boys stuff was our absolute favorite this year. So cute! See all our picks and what we got below! Definitely some must haves for boys this year! If you're going to choose one thing to buy, it has to be the gray joggers below! They are such good quality, the softest material, and super cute! For men's our top picks are the Travis Mathew shirts. We always include them in our mens gift guides because they are seriously the best! Super comfy material and great for work and of course golf! The jeans below are also great. Mike (Paige's husband) got them in two colors! They're a great fit and a great deal for AG! A good pair of white a white pants that don't add on the lbs or show off your undies is hard to come by! We love white pants for summer and feel like they brighten up any outfit. We've rounded up a few of our favorite, tried and true pairs below. Links at the bottom of the post! Regan's are obviously her faves, since she's worn them in the last two posts 😂. Hey, when you know, you know! You all know by now that we love a good casual summer look with a cute, comfortable wedge! Yep, this is our go-to for sure. It's actually so awesome having sisters (and a mom) who all share the same style. We all own the same tops and jeans in different colors/washes and can easily borrow and rotate clothes between each other 😂. I (Regan) am actually borrowing my mom's Madewell top here, and Paige's necklace. Hehe. You may have already seen Paige's bag in her favorite things post. It's super inexpensive and adds something so cute to any #basic outfit. Details below! 6 Ways to Wear Your New Favorite Accessory! I feel like that title is suuuper long, but also very accurate. If you haven't jumped on the hair/neck/wrist scarf train yet, you need to get in on this! These cute scarves/bandanas that are so in right now are the perfect accessory to add to any outfit. The one's I've found and am wearing in this post are also super inexpensive. Today I'm sharing my favorite ways to wear them. 1. Tied around the wrist. This was the first way I ever accessorized with a scarf. It's subtle, but adds a cute little pop of color to any neutral outfit. To tie, fold the scarf into a triangle, then continue to fold until it becomes long and thin. I placed my wrist (palm facing down) on top of the middle section of the scarf, then wrapped each end up and around my wrist twice, so that the two ends ended up on top of my wrist. I then tied the ends in a double knot. 2. Tied at the end of a braid. I love this style, especially when wearing a hat! I think this looks best with a looser braid, and with extra hair left out on the ends. Secure your braid with a hair tie, then double knot your scarf (after you've folded it up long and narrow), with the knot above the hair tie so it stays secure. 3. Around a top knot. Lately I've been loving wearing my (3-day post washed) hair in a half-up top knot! I love having my hair out of my face, and this is a cute way to keep it up while still having some hair showing. First, secure your hair in a top knot using a hair tie. I do my half-up top knots by wrapping my hair around like a ballerina bun, then pulling it apart a little to create a messier look. With this look, you want your bun to be pretty high on top of your head so that you can still see some hair over the top of the scarf. Take your folded up scarf and start with the middle part of the scarf at the back of your bun, tie both ends around to the front, cross over, and then cross over again in the back. Tie the two ends in a double knot at the front of the bun. You may have to adjust how many times you tie it around depending on how long your scarf is. This is probably the most common way you see people wearing scarves. Again, I love how it adds just a little something to a simple outfit. For this look, just fold up your scarf so it's long and narrow again, then start with the middle of the scarf at the back of your neck and tie the ends in front. I like to tie mine off to the side. 5. Wear as a headband. This is another cute and fun way to keep some of my hair back and out of my face. To tie, tuck your hair behind your ears, then place the middle part of the scarf under the bottom of your hair, and tie the ends together at the top, right over where your hair is parted. 6. Around a messy bun. 7. BONUS STYLE: Tie around your favorite bag. Had to add this in because I love the look of a scarf that matches your outfit, tied around your bag! I linked the two scarves pictured in the photos above, as well as some of my other favorite scarves below. Although the scarf in the beach photos is currently sold out 😭 but the store I got it from has some other super cute ones. 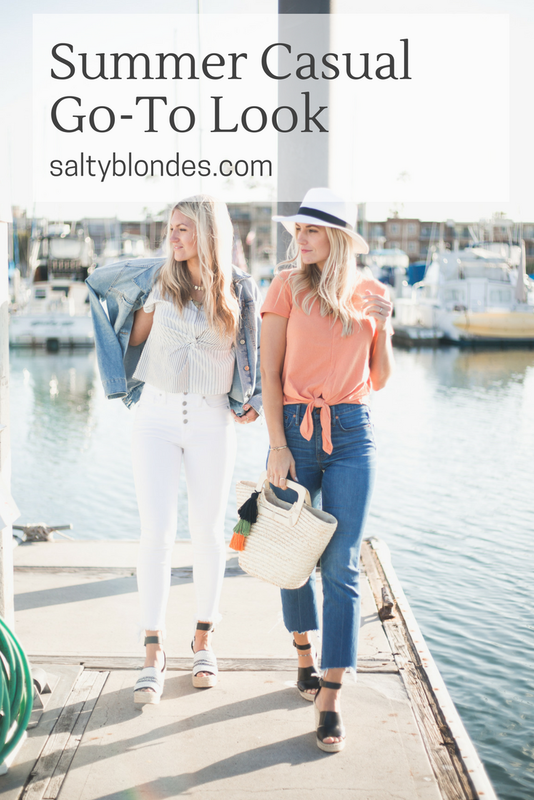 Find them here (use code saltyblondes for free shipping on your order). Hi friends! We just wanted to put together a quick post sharing another one of our favorite trends this summer. Tie front tops! We love this trend for summer because it just adds such a cute element to a basic tee with jeans look! 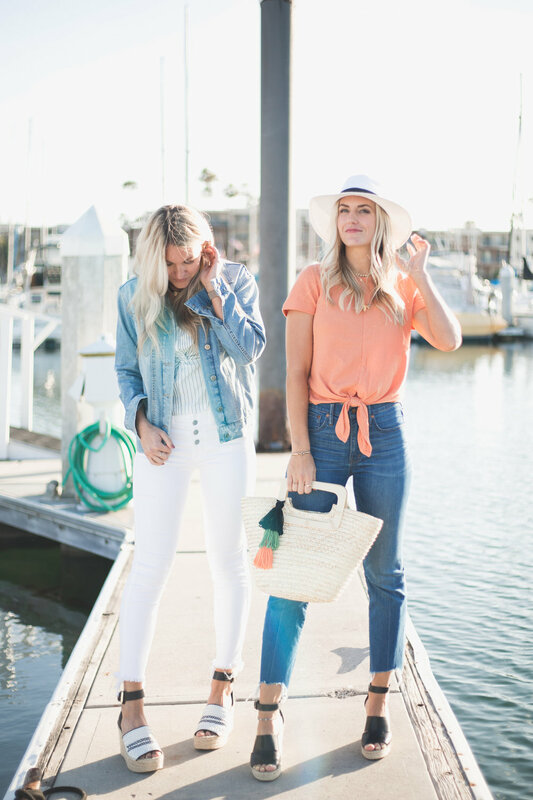 Some of our favorites are from Madewell (pictured below), but we found lots of other cute ones too that we've linked at the bottom of this post! Anyone else LIVE in dresses all summer? One of our favorite summer combos is dresses with denim! Below are our two dresses pictured, along with some of our other favorite easy, summer dresses this season! I finally got one this year and have to say it just adds something to your outfit. The one I'm holding above and have linked is from BP so it's super affordable (under $40)! It goes with everything and you can switch out the little pom hooked on it to one of your own or a cute scarf! Super fun for summer! Ok this may be random, but I LOVE this gift wrap organizer! I used to have everything just shoved in a closet is our old house. I finally got this from my mother-in-law and am obsessed. It fits perfectly in an average sized coat closet, so we put it in the one in our office. I keep boxes in the bottom two larger drawers, and cards, tissue paper etc in the top three smaller drawers. As you can see in the photo below theres a spot on the sides for wrapping paper and ribbon too! I've posted about these before and am posting again! I love these so much and they're the ONLY flip flops I can where ALL day whether I'm walking miles and miles on vacation or just around town. They have the comfiest soles and perfect arch support! You've probably seen me wearing them multiple times on our instagram stories, because I have one on all the time! All of their hats are the cutest, but I especially love the look and fit of their baseballs caps! 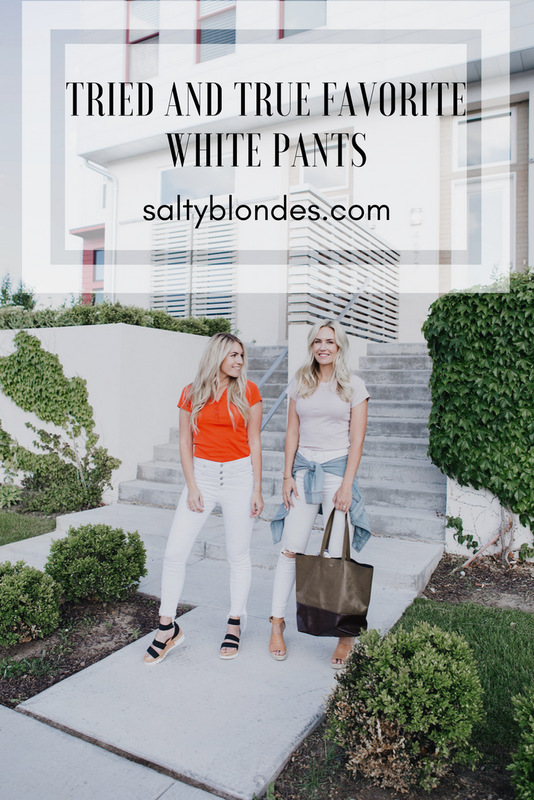 Use code: saltyblondes at checkout with them for free shipping! Ok guys, these tees are pricey (fair warning)! I got one with a gift card and then had to get another when I saw one on sale because the fit is so perfect! They have a couple questionable prints haha, but there are some cute ones too and they're so flattering and comfy! I love them because they're made out of a nicer fabric, so they not only look great tucked into high waisted jeans, but with skirts too! Ok guys, I'm including this as a bonus but not actually on the list for a few reasons: 1. It's KIND OF sponsored (I got it for free). BUT I reached out to THEM for it. 2. It's expensive! That being said, I do love the product. It tastes yummy, and although it may be the placebo affect I feel like my skin actually looks better already! Basically it's a collagen peptide drink mix (all the rage these days) with other supplements in it too like Biotin which are supposed to help your hair, skin and nails look fabulous. I've been taking it for a week and really like it so far! If you've been following us for a while, then you know we LIVE for a good basic tee. We like to keep it casual 90% of the time, and when we find a good casual t-shirt, we usually buy it in multiple colors! These striped Madewell tees are a couple of our most recent favorites, and they pair perfectly with our most frequently worn, high waisted Madewell jeans! We love how casual this look is for summer, especially when worn with these adorable jean + linen baseball caps! We linked more of our favorite, tried + true basic tees below. This is Sidney + Regan's favorite, most over-worn (lol) tee. They both have them in multiple colors. This is one that Madewell always has in stock, and is always coming out with in new colors. There are also always colors that will go on sale for $14, so make sure to check to see which ones are marked down! site if you don't see the color/style you love currently available. website and buy directly from them. Click on the images to shop all of our favorite tees below (we added a few more, not talked about above). Thanks for reading! These are two of our favorite colors to pair together! For some reason we used to think you couldn't wear blacks + browns together. Now we love mixing the two colors in the outfits we wear, and in our home decor! Below are two casual outfits showing how we paired the colors together. My (Regan) dress is so comfortable is only $21! Like, whattt? My shoes are just as comfy, but, unfortunately, not quite as affordable. So worth the splurge though to at least have one cute pair of espadrilles this season. I got mine last year, and this same pair is still selling in stores and so on trend. These are Paige's new favorite pair of jeans! The perfect #momjean and so easy to wear with a fitted top and statement necklace. Throw on some cute wedges and you have an easy, perfectly put together date night outfit. Last thing I want to talk about is my cute hat! I've been so in to hats lately and Gigi Pip is making all my dreams come true from their baseball hats to their wide brim fedoras, and everything in between. Their spring collection is heaven, which also includes the cutest scarves, bags, and now sunglasses! Go check them out, you won't be disappointed. Use code saltyblondes for free shipping! Below are a couple more easy, casual outfits where we paired black + cognac together. Now to show how we combine blacks + browns in our homes. Below is a shot of the office in my home. I wanted to go with a black + gold color scheme, but am loving the pop of color that the cognac chair in the corner adds. Paige just added these cute bar stools to her kitchen. The ones she had before were black, and it's amazing how much adding this cognac color adds to the space. Hi guys! It's been way too long since we've done an outfit post. I feel like we always say this, but our lives have been crazy, and we've just been linking outfits on insta as of late! I finally had some time to sit down and put our last few outfits we've posted about on Instagram together in a post. So here you go. Best part is, most of our outfits are on major sale now that spring is almost here! This next look is definitely my (Regan) go-to. Some high-waisted denim with a casual tee. You can find me in this outfit every. single. day. Loving the Sol Angeles x Anthrologie tees lately (even though they are a bit pricey for a t-shirt), and these slip on sneakers have been my absolute favorite during the "warmer" winter days here in Utah. I have them in two colors, and the black pair I'm wearing below are lined with fur (yasss). These are a couple more cute, everyday looks that are a little more put together. Paige's boots make such a fun statement and are currently on major sale! This last look is all about the neutrals! Nothing better than cozy neutral sweaters that go with everything! Now, time to bring out the spring clothes! Hello cropped denim, cute wedges, and lightweight jackets! A couple months ago I went to Trilogy in Midvale and tried out CoolSculpting for the first time on these thighs! Haha. I documented the whole process on our stories on Instagram, but it takes a couple months to see the final result which is why I've taken so long to post about it! If you're unfamiliar with CoolSculpting, it's where they apply a handheld device to specific stubborn fat areas on the body for about 30 minutes, which freezes the fat and your body gets rid of it over the next few months! I did it on my inner thighs, and was told to expect about a 25% fat reduction on the treated area. Most people want 2-3 treatments over a period of 9 months or so, but I am pretty happy with the results and may just stop with this one! Below is a before/after photo. I didn't use the actual ones they sent me because I'm in my lace underwear and my sisters thought it looked inappropriate to post! Haha but send me an email if you want to see them and I'll send them to you! Also, read to the bottom to find how to get a major discount at Trilogy Med Spa and for outfit details! Sorry for the low quality of the before photos! They didn't have their camera at the time, so they were taken with an iPad. As you can see though, my inner thighs are slightly smaller which is exactly what I wanted! CoolSculpting is not for major weight loss. It's for treating smaller, stubborn areas that you may not be able to get rid of with diet and exercise. I did not lose any weight from this process, but do love the result! As for the actual process, it was super simple! I brought my laptop and got some work done while I was there, and was in no pain at all. It took about 30 min on each leg! It's very cold when they first apply the device, but then you just go numb and can't feel anything. If you have any questions about CoolSculpting or are thinking about trying it yourself, feel free to email me or comment below! Make sure you DO YOUR RESEARCH before you get it done, because it makes a huge difference who you go to! I loved how knowledgable they were at Trilogy and highly recommend them. If you DO end up going to Trilogy for anything (facials, botox, CoolSculpting etc.) make sure you mention us for a great discount!